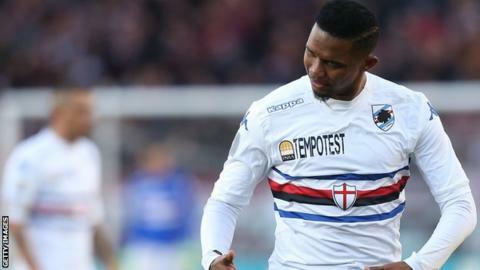 Samuel Eto'o will stay at Sampdoria despite a reported training dispute with boss Sinisa Mihajlovic. The Serb coach accused Eto'o of showing a "serious lack of respect" by missing an extra training session on Monday. But a source close to the striker, who joined Sampdoria from Everton last Tuesday, told BBC Sport: "The incident was nothing to report." The source also dismissed claims in Italy that Eto'o, 33, was threatening to leave the Serie A club. "He can't leave anyway, because he has played for two clubs this season, and you can't play for more than two in a season," he said. Mihajlovic scheduled two training sessions for his players on Monday after Sunday's 5-1 Serie A defeat at Torino. Eto'o - who appeared as a second-half substitute in that defeat - left after the morning session without speaking to the coach and did not return, according to Italian media. "I don't know where he's gone and I don't know what the club intends to do," Mihajlovic told Gazzetta dello Sport. "The only thing that is certain is that the player did not give me any explanation; I consider it to be a serious lack of respect to myself and the rest of the team. "That's the only truth today, the rest is pure fantasy. There hasn't been a row with Eto'o, simply because you need two people to have an argument and he has done everything on his own. "I haven't seen him since the morning training and haven't spoken to him either."